It takes a bit of planning, but it can be done. On this page you will find some challenges that we urge you to take up to help keep rubbish out of the landfill. Take some of them on – we dare you! The surest way to keep rubbish out of the landfill is not to buy things that will end up there. By rethinking our buying habits we can avoid worrying about what to do with rubbish, have less impact on the environment, and keep rates down by spending less on the landfill. By not buying products with excess packaging or in packaging for which there is no recycling market, we also send manufacturers and retailers the message that we want less packaging. One of the more recent issues is the number of products that are marked as recyclable, biodegradable or compostable. In New Zealand, in many cases, they are not. Typical examples are ‘compostable or biodegradable’ coffee cups and ‘compostable or biodegradable’ disposable nappies. Our landfills are closely compacted for health and safety and space reasons. That compaction does not allow air to get to the rubbish. This means that the conditions are not right for composting – anything that goes into a landfill is not composted. For similar reasons, these products should not be added to home compost piles – the conditions are not suitable for composting things like nappies or plastic coffee cup lids. The same with recycling claims. A product can only be recycled into a new product if there is a facility that can handle it. In New Zealand, with our small population, there are a limited number of facilities that can handle things like soft plastics. 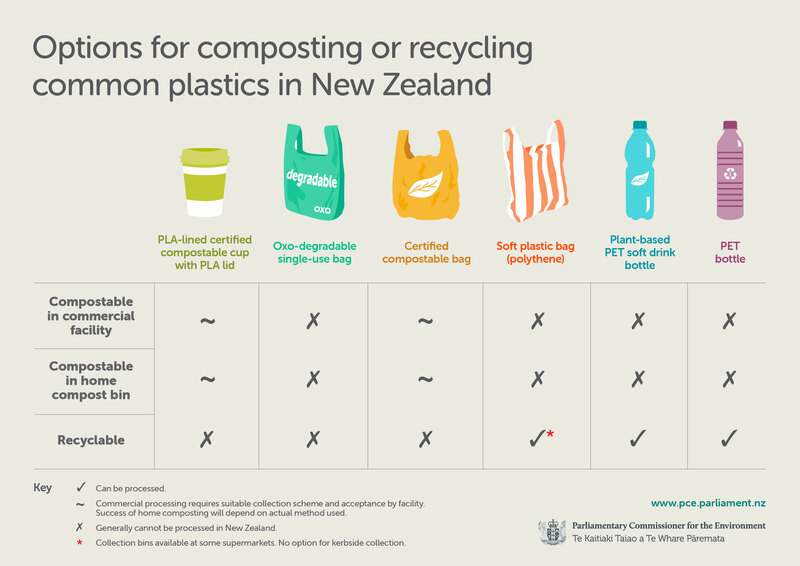 More information on biodegradable and compostable plastics is available in this publication by the Parliamentary Commissioner for the Environment. We are lucky in Hawke’s Bay in that every last shred of paper and cardboard put out for kerbside recycling is processed locally – turned into apple and pear trays. In fact, the company doing the recycling cannot get enough of it! The other products we can recycle easily are clean glass bottles and jars (not drinking glasses, window glass, spectacles, mirror or crystal . . .). The bottles and jars are crushed locally and then shipped to a recycling company in Auckland which processes the glass into new bottles and jars. Plastics are more problematic, primarily because it is difficult to convince people to wash their bottles before putting them out for recycling, and that the types of plastics that recyclers are prepared to take are limited. In Hastings, we collect only bottles marked 1 and 2. While Council is collecting bottles of all colours, the market prefers clear and opaque bottles. We need to sort the plastics that we can recycle from those we can’t. Including plastics that cannot be recycled (here or internationally) risks the whole lot going to landfill. Certain classes of plastics (bottles 1 and 2, clear and opaque), if clean, remain a valuable commodity for recycling, however, unsurprisingly, there is almost no market for smelly, dirty plastic. We need to keep it clean! For more on our kerbside recycling service, including what you can and can’t put out, take a look at the Kerbside Recycling page.